In the past I wrote extensively about Fitbit’s Product-Market fit or lack there of. Despite overly aggressive predictions from analyst firms on adoption of fitness devices, abandonment rates cautions us to take careful view of Fitbit growth. Since I last wrote my take on Fitbit it had made three earnings announcement. While Fitbit posted units and revenue growth in all three reports its stock took severe beatings after two of the three earnings reports. After the recent July report the stock has been on upward swing. It appears its Alta and Blaze models are selling briskly. According to MarketRealist, Fitbit made 56% of its revenue from these two new devices. There are rumors about newer models of its Flex and Charge models. Yet warnings signs aplenty if you look closely at Fitbit numbers. Here are three charts that flash warning signs for Fitbit. I compare only those metrics that are not affected by seasonalities – Gross margin and Average Selling Price (ASP). 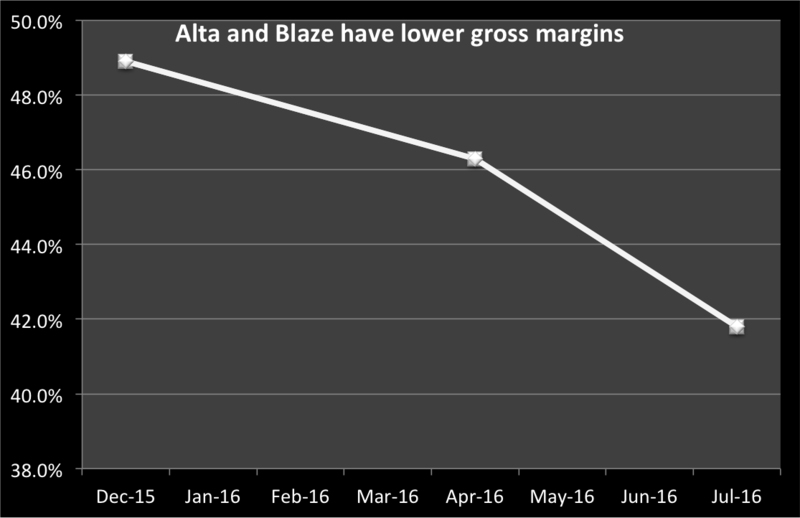 Since the introduction of its new models Alta and Blaze the gross margin has taken a turn for worse. It appears Fitbit was able to make more per unit from its Flex and Charge bands than it is from flashy newer models. The chart shows combined gross margin drop. This tells us Fitbit’s pocket price is likely much lower than the list price for these units and/or its inability to control the bill of materials cost for these devices. The ASP (across all bands) improved from $88 to $105 in the quarter it introduced the devices. 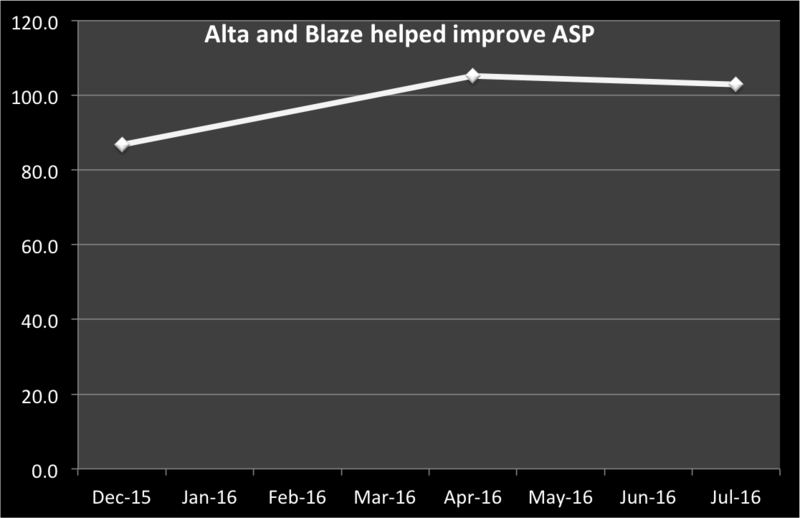 The list prices of $130 and $200 for Alta and Blaze respectively helped with this ASP improvement. But when we look at the most recent quarter we see a drop in ASP. This is especially a big concern given this was the first full quarter the devices were available compare to the previous quarter when the the devices were available only in the last month of the quarter. The previous ASP number was the blended ASP across all its bands. Given the numbers from MarketRealist that Fitbit made 47% and 56% of its revenue from just these two devices we can compute the blended ASP of just these two bands. This should give you a pause. The new models did well when they were new but then their sales seem to be driven more by promotions than by customer demand. It is a pretty steep drop within one quarter. Doing a quick channel check shows there are several promotions of $20 or more available on these devices. 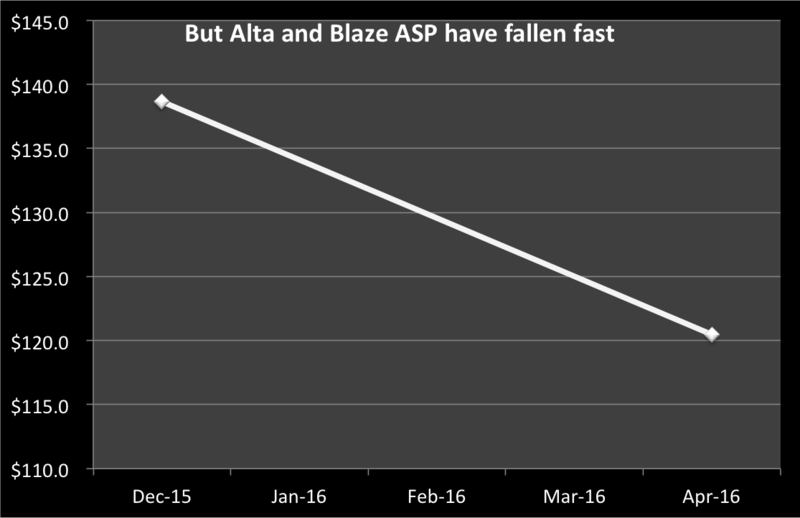 Blaze should be a bigger driver on increasing ASP from its $199 list price but its influence will wane when the rumored Charge 2 comes around in Fall. As the Charge 2 gets more features it will make Blaze look less attractive with more customers picking either Charge 2 or splurging to buy a real smartwatch from Apple. ← How is this still a business?